Badminton is a popular sports in the world. Kids, adults or elders everyone plays loving it. It is normally played between two individuals and the playing instruments involve badminton racquets, net and a shuttlecock. The shuttlecock is the most important part of sport. There are basically two types of shuttlecocks. They are distinguished on the basis of the materials used to manufacture them. The two type of shuttlecocks are feather shuttlecock and synthetic shuttlecocks. Synthetic shuttlecocks are good in terms of durability. They can last for more matches so they are good for practice. Feather shuttlecocks are not that durable because of the normal wear and tear during which the feathers get damaged while playing. These feather are stuck on a rounded cork base. 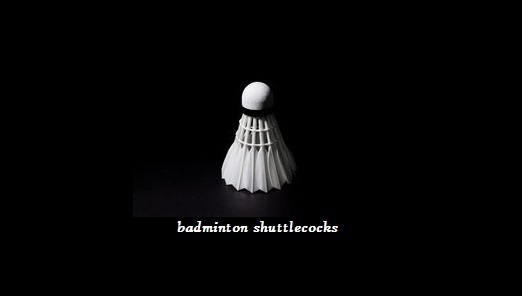 The downside of feather shuttlecocks is they are expensive but they have good speed because of which professional badminton players like to use them. Choosing best badminton shuttlecock for you – Normally the playing conditions are used to determine the kind of shuttlecock to be used. There are 14 to 16 feathers in the shuttlecock. In hot conditions, the shuttlecocks gather more speed which is exactly opposite in case of cold weather conditions. These factor is considered while conducting international matches. Synthetic shuttlecocks offer less stability because of which they are only used in practice sessions in different sports clubs, colleges etc. Dimensions of a badminton shuttlecock, international standards – As per international standards the ideal weight for shuttles is between 4.74 to 5.5 grams and the length is between 62 mm to 70 mm. In general, the progression of an athlete begins from using shuttlecocks which have got less speed to more speed. Each shuttlecock has got specific colours like Green, White etc at the base. This colors indicate the speed of shuttlecock. Shuttlecocks cannot be stored for a long time when they are not used. They start degrading after few months. Maximum they can stay in good condition for a year. There are different studies done to understand the movement of shuttlecock. The shuttlecock always falls down with its nose ahead so that each player can hit it without getting the feathers stuck inside the racquet. It flips on impact with a racquet. The conical shape of the shuttlecock effects the movement of it in the air. It is important to note that the shuttlecock do not make a full 360 degree rotation. Professional badminton players try to hit harder so that the shuttlecock flips faster. They have more killer shots as a part of the tricks. There are different kinds of strokes which the players play for different trajectory movements. The ‘Smash’ is regarded as the most killing shot as it is hit with full force downwards. The body movement also influence the movement of shuttlecock in the air. Badminton is more related to strength and technique. The one who masters both eventually becomes the champion of the game.